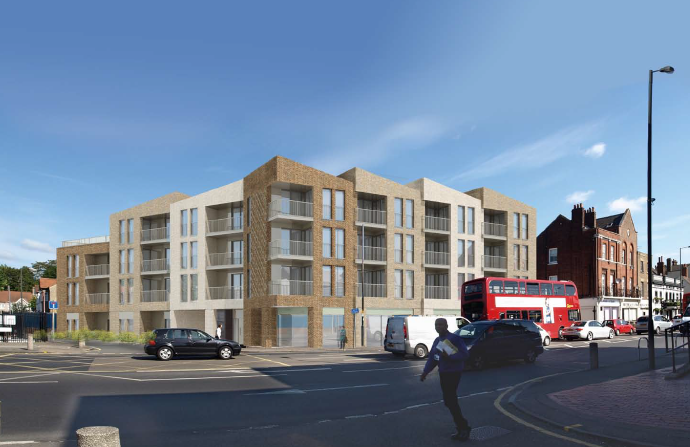 Merton Council gave planning permission for a four storey block of flats on the former Kwik Fit site in January. This was despite our strong objections and the protests of local residents. The Council’s own Design Review Panel gave the building an amber rating and a Cricket Green ward councillor also spoke against the development at the Planning Committee meeting. The development site is in and will damage the Cricket Green Conservation Area. As the Council’s own policies state that new developments in a conservation area should ‘preserve or enhance’ it this could have damaging consequences for development proposals elsewhere in Cricket Green Conservation Area and for other Conservation Areas in Merton. We have organised a petition, which will be presented to Council, asking that the area of the development be removed from Cricket Green Conservation Area because it is not fit to be included. If you share our concern then please support us by signing the petition. 1. Print out the KwikFit site petition, sign it and return it to us at Mitcham Cricket Green Community & Heritage c/o MVSC, Vestry Hall, 336/338 London Road, Mitcham, Surrey, CR4 3UD by 14 February at the very latest. You can post it or drop it in. We must have the original sheets for the signatories to count! Please also consider asking others to sign and if you need more than one sheet then please print additional copies rather than asking signatories to use a blank sheet of paper. Thank you. Your support will help protect Cricket Green Conservation Area for everyone to enjoy. This entry was posted in Cricket Green Conservation Area on January 30, 2016 by mitchamcricketgreen.